Activity weeks are a way of focusing energy and attention on the local environment and initiatives to improve it. They are particularly effective if they become an annual event and even more so if part of a national programme. A programme of events and activities is produced on a suitable theme. One week is a good length for making an impact but it can be longer or shorter. Organisations and individuals are invited to organise activities and events during the week and have them advertised in the programme. The programme is promoted by a coordinating body which may be a partnership, preferably including local media. Hastings, UK, 1990, Nick Wates. 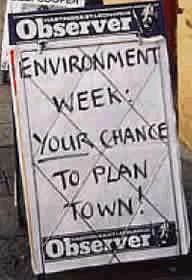 Local newspaper promotes an 'Environment Week' programme. Other common themes are 'Architecture Week', 'Urban Design Week', 'Preservation Week'. Organising a first activity week will take a lot of effort. Once established as an annual event, they become relatively easy to organise as participating organisations know what is expected of them. The main coordinating task then involves compiling the programme. Make sure the programme is produced well in advance and widely publicised. Get it printed in the local paper in full, preferably as a pull-out. It helps if national organisations can provide an overall framework and get local organisations to co-ordinate local programmes. Core costs: printing programme, co-ordination (several person weeks) launch event. Costs of individual activities should be covered by participating organisations. Plenty of scope for securing sponsorship. Key ingredients: Theme; dates; timetable of activities; map with location of activities; credits; further info contact. A way of suggesting ideas for next year’s programme could also be added. For most imaginative local project, group or individual. For best kept gardens or shopfronts, best improvement ideas, best kids' drawings, etc. Exhibitions on week theme by local businesses, voluntary groups, artists, etc. Around area of interest. Or for birdwatching, looking at wild flowers, etc. Pre-week gathering for organisers, exhibitors, sponsors, the media, etc. Help clear up an eyesore. Bags provided. For projects, organisations, professional offices, etc. See round fine local buildings or gardens. Formal event for press, dignatories, etc. End of week celebration for organisers, etc. Unveil a plaque for a recently completed project or launch a new initiative. On a theme of current interest, inaugural meeting of new group, new initiative, etc. Refreshments with a relevant theme. Create a garden, build a play structure, dig a ditch, paint a mural, clear a pond, etc. Clear out the cars for an evening. Plus normal festival activities: facepainting, music, dancing, juggling, theatre, poetry readings, sculptures, races, and lots more. Civic Trust for ‘Environment Week 1991’ which included 350,000 leaflets, 50,000 ideas for action booklets, 250,000 badges, 40,000 window stickers, 65,000 posters, 500 balloons and 100 banners. Over 3,000 events were held throughout the UK. Interviews were screened on 13 national TV programmes and at least 2,200 items published in newspapers.